Enchant, the world’s largest light maze & market is lighting up USA for the first time ever, and has made its home in Arlington! Sip on hot chocolate or warm glühwein we’ve come to love, try on your skating legs at the REAL ice rink, shop for Christmas gifts from some of the best vendors around or get your fill of DFW’s best food at one of the gourmet food trucks cooking up family-friendly fantastic grub on the daily. WITH LIGHTS! And boy, do they have lights. This is the world’s largest light maze, after all! 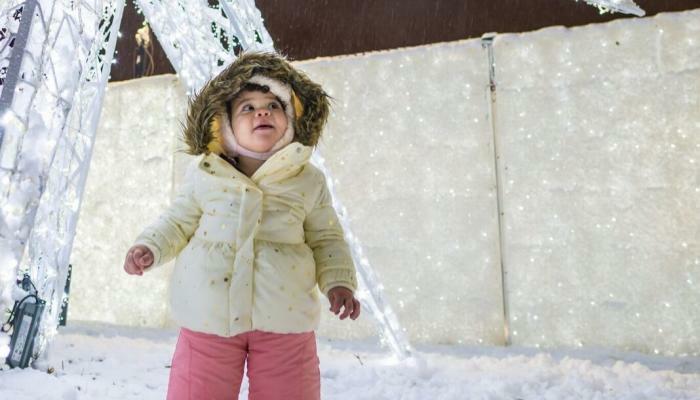 Explore rows upon rows of lights in the light tunnel, or feel like Rudolph (or find him) while leading the way in the maze’s fun find-all-9-reindeer activity. Plenty of photo ops (we’ll get to that later) abound, see your loved ones in a “new light” with every twist and turn. Fill up on some grub at Enchant! Enchant’s got 21 different food trucks up its sleeve during the entire event, with quite a few posted up each day. Have a favorite food truck? Check their social media to find out what dates they’ll be serving up the goodness at Enchant! Plus, peruse the independent vendors that serve up delicious popcorn, raw milk cheeses, delicious gourmet pudding, other sweet goods including gluten-free macarons or, a Quarkbaellchen (a cream cheese fritter) while doing some shopping in Texas Christkindl Market Lane! Adorable handmade jewelry? Yes. Crocheted goods? They’ve got it. Unique gifts from around the world? Yes, yes yes! Shop the Christmas Market in Enchant for one-of-a-kind gifts and gadgets, new meal kit subscriptions (like to Hello Fresh!) and more to help check off your most discerning gift recipients on your Christmas list. Shop handmade pottery, candles, artisan soaps, books, pet items and much, much more! What better way to burn off the calories from Thanksgiving and prepare thy body for Christmas than to get on the ice and skate a while (trust us, just 30 minutes can burn up to 250 calories!)? Ice skating is $5 per person for the rental and goes to charity! Plus, if you have your own skates, you can forgo the rental fee and take to the ice like the Kristi Yamaguchi you are. Texas Christkindl Market Lane wouldn’t reflect past Texas Christkindl Markets without one important feature – delicious glühwein, German mulled wine that is as aromatically Christmas as it is tasty. There is also beer and delicious hot chocolate to wet your whistle.